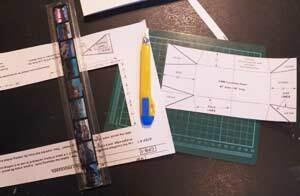 This Page is PART 1: The boat and making a model What am I building? PART 5: Finishing and Launching while the peanut gallery looks on. "Why!!" you may ask, am I building a plastic sheet folding boat? Just for fun, I would answer. Because it's an odd little boat building project. It will not take much time, is not expensive, and it's just a quirky non standard use of a familiar material that tickles my curiosity. It costs less than going out for fish and chips and a beer or a moovie and popcorn with my sweety and its not fattening. 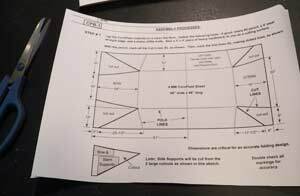 I had run across Ken Simpson's Webpage and he offered a one sheet folding coroplast boat plan for free. 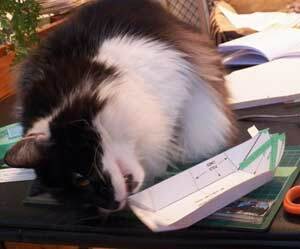 If this boat turns out to be reasonably usable, I will fold it and keep it in the Tanzer as a safe conditions tender. I sometimes go to the beach and anchor off shore. It would be useful just to have a handy boat and not have to tow my tender. The next time I was in the hardware shop I noticed a sheet of Coroplast!! I checked out the suggested tape and calculated that the project would cost me less than 60 dollars Canadian including taxes. I had a quarter sheet of plywood in the basement already and bits of wood and hardware. The boat is essentially one sheet of plastic folded up with a couple of thwarts and side supports. 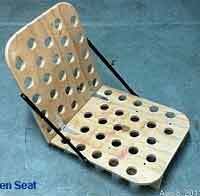 He suggests using a folding seat, (free plans). On his prototype he has an elegant cowl front and back but that is not necessary. There is a plywood floor to help distribute the weight. This is where the majority of the weight of the boat comes from. The whole boat and seat should come to less than 20 pounds. 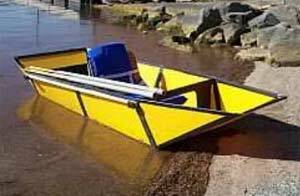 I'm building this in full knowledge that it is an experimental minimalist boat and that it is not designed to run rapids! I think it would be a useful accessory to keep in the Keel boat for when I anchor off the island to go swimming on a warm day. Might get my towel and my lunch to shore and back dry. I will modify only one thing. Instead of cutting out a part and joining the 2 edges to make the front and back seams, I will fold them in. In this way if the tape lets go, then the boat will still be solid and not have a seam fail. There is my paranoia. 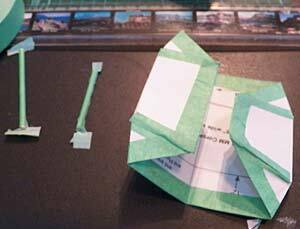 Because the coroplast has air filled chambers running the length of the sheet and they are sealed with tape, the boat has build in buoyancy. I downloaded Ken's plans and printed the layout page. I checked that it was to scale and it was close enough for my purpose. I printed it on an old file folder. If you look at the 4 corners you can see darker triangles that are marked to be cut. I will instead make a fold and tuck the inside. 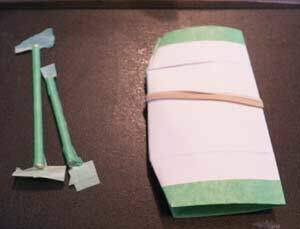 I've cut out the pattern and scored the folds with the handle of a fork. I can see that not cutting the corners will make it much harder to fold. I have a page on how to work with coroplast. I plan to score the plastic with my screen wheel and I think I will be able to fold it. You can see the folded corners at the bow and stern. I'm bending instead of cutting and taping the open edge. It will make it much harder to fold and safer to use. The folds are being taped shut. Winston holds the boat while I tape. I will also tape the edges. It makes it look better and on the real boat it will seal in the air inside the plastic channels and create reliable buoyancy. Since the coroplast is made from polypropylene it would float anyway. Front and back has a wooden thwart to keep the sides in place. I used bamboo sticks. The plans for the real boat use small boards screwed in using T-nuts and 1/4 inch bolt so they can be easily removed for folding. The plans also call for thin wood strip across the bow and stern to stiffen and prevent distortions. To stiffen the sides between the thwarts the design calls for some poly conduit screwed along the edge by the same bolts that fasten the thwarts. The boat folds easily along a score running across the beam in the centre of the boat. It folds up without any trouble. The bottom plywood would tuck inside the boat and would make a bundle about 2 x 4 feet by about 6 inches. Tidy bundle would fit easily on my bike trailer, or in the v-berth of the Tanzer. Note that it is not a safe emergency boat. It might be useful as a tender in calm protected waters. What did I learn while making this model? The plan is quite simple to put together. 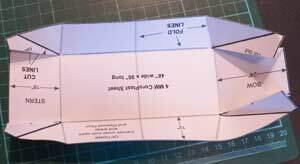 I will have to carefully pre-score all the folds and any inaccuracy in the position of the folds will result in wonky boat or wonky folded bundle. 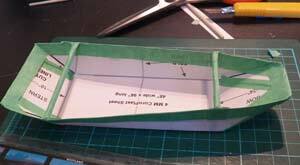 Rarely does a model mirror the real boat building method so closely. A couple of evenings should be enough. 3M Scotch-weld Adhesive. Some people have reported great success using it for polypropylene. Pricey adhesives for tricky glueing.You can get away with not buying a special nozzle that mixes the glue and just mix it yourself like 5 minute epoxy. I've used Gorilla Tape and it works on coroplast. If you try you can pull it off but it stays on. Scotch extreme duct tape also worked for me. Some Coroplast boats Experiments by various designers and tinkerers. Coroplast information it comes in many different thicknesses and there are many different brands. Glues and Adhesives tested on Coroplast. Not much will stick to it.